Middle Rock Coastal Rhythm + Blues is on again for 2019. So rally the gang, shake out your picnic blankets and come and enjoy awesome music, entertainment for the kids and a wonderful atmosphere. Backing onto Tomaree National Park, our camp grounds is the perfect spot to sit in tranquility and enjoy the soulful tunes and coastal beat of our East Coast talent. We love for the whole family to come, so again this year the kids are FREE!! With Jumping Castles, temporary tattooing and face painting to entertain, the kids will not be disappointed with day. Terms and conditions apply, children must be 12 years and under and must be with a responsible adult who holds a valid ticket to enter complimentary. With variety of food trucks to keep you well fed and our Rockpools Bar to keep your thirst at bay, your day will be one to remember!!! 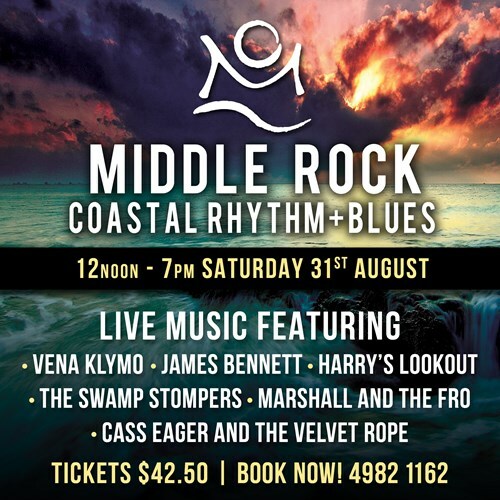 Middle Rock Coastal Rhythm + Blues is a licensed event, NO BYO ALCOHOL or NON ALCOHOLIC BEVERAGES. Food and water is permitted. Opening for 2019 will be the amazing Vena Klymo, kicked back and enjoy her coastal vibe. Our old friend James Bennett is returning for 2019, James is an Alternative Roots/ Folk artist from Newcastle NSW. No stranger to playing live, James incorporates 12 & six string guitars, weissenborn lap steel, stomp box & harmonica into his performances & has been playing to audiences across the East Coast of Australia for the last seven years. Along the way James has supported for much loved Australian artists such as Diesel, Wendy Matthews, Ian Moss, The Black Sorrows, Rick Price & Dan Sultan. Harry's Lookout is a Novocastrian Rock, Blues and Folk group and are currently in the process of recording their their first full length album "Cause and Effect". " We're very pleased with the way things are coming together and can't wait to get some new music out to everyone soon!" The band regularly appears along the coast including: Sydney, Pacific Palms, Newcastle, Port Macquarie, Oldbar and Catherine Hill Bay. Having met at Southern Cross University in Lismore back in mid-2012, founding members Corey Legge (guitar/lead vocals) and Mitch Broadhead (drums/backing vocals) set about building a monster. Initially the creature only required one very sturdy leg and a broad head, but it was soon decided that this swamp-creation was missing one vital feature. The lightning bolt of inspiration came early in the piece when bassist, vocalist and circular-breathing extraordinaire Luke Ligtenberg slithered into view, adding the final element to bring the three-pronged colossal to life. Since this fateful merging of musical minds, The Swamp Stompers have set about earning themselves a significant reputation as one of the most promising up-and-coming acts to emerge in recent years. The powerhouse trio, which as of 2018 features Oliver Morley-Sattler behind the kit, has stomped their mark on prominent Australian festivals such as Caloundra Music Festival (QLD), Blues at Bridgetown (WA), and the Sydney Blues & Roots Festival (NSW), with rave reviews from punters and peers alike. Middle Rock Holiday Resort supports and encourages responsible drinking. No Refunds will be provided on Tickets sales. Tickets may be transferred to another guests name, Terms and Conditions apply.